Cliff Outdoors The Headliner fits on all visors and can be easily removed. The Cliff Outdoors The Headliner has slotted foam securely holds all flies. 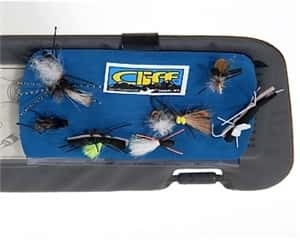 Cliff Outdoors Headliner for the angler who sticks his flies all over the inside of his vechicle. If you’ve fished for a while, chances are somewhere in your fishing rig there are flies impaled in the upholstery. Of course, a few of these flies inevitably have barbs and are there to stay. Now, if you want to be like Cliff Outdoors Big Cliff Fly Box and decorate the F-150 that way, that’s fine, but a better alternatives would be to get yourself the Head Liner. It fits on all visors and can be easily removed. The slotted foam securely holds all flies. Add a push pin and you can also temporarily attach those items (to-do lists, parking tickets) that aren’t really important, but you may want to keep.